When you think of climbing rope, you might remember gym class in high school or scenes from military boot camps. But climbing rope can add much more fun and variety to your work outs. Don’t count yourself out if you don’t think you have great upper body strength either. Climbing rope is about your legs and feet as well. 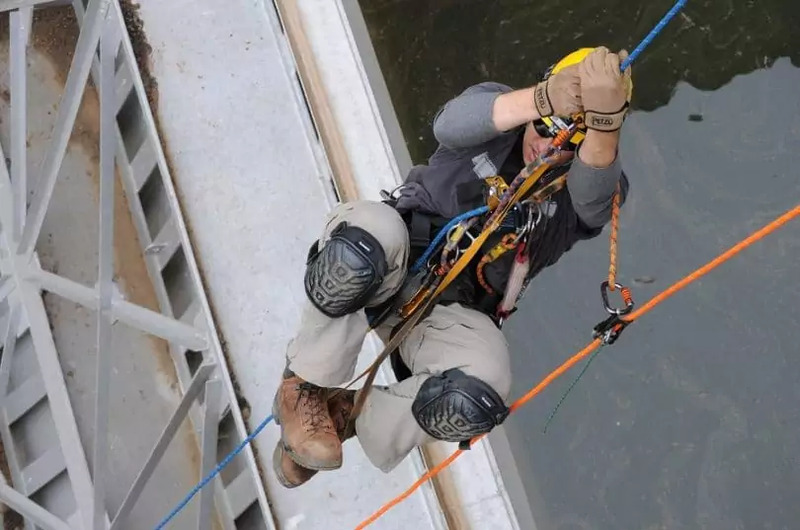 In this article, we’ll talk about the benefits and challenges of climbing rope, the equipment involved and most importantly, how to climb a rope in fun and effective ways. It’s a full body workout and offers many different types of movement. Build upper body strength (especially lats and biceps) and muscular endurance. It’s simple to adjust the workout to your desired intensity. Ropes obstacles are found in many adventure races. Safe and accessible for everyone! Relive those middle school recess days! Be able to lift your own body weight. You never know when you will need to pull or lift yourself to safety! You might be thinking all you need is a reliable rope and somewhere to tie it to get started, but there’s a bit more to rope climbing than that. It’s important to understand your options when it comes to equipment so you can be safe and tailor your climbs to your workout goals. If you’re only using your rope for exercise climbing, choose a rope with a diameter of 1 ½”- 2” and about 20ft in length. Check out our guide on how to select the top climbing rope to help you. Manila rope comes from the natural fibers found in Abaca plants. This is the type of rope you probably remember from gym class. It’s thick, heavy, and strong. They fray over time and are rough on your hands, but will get the job done for years to come. This rope’s wide circumference will hold your weight easily. Manila rope is common especially for the military, making it easy to purchase. Look for it in military surplus stores, online, and your local hardware store. Polyester rope is a little easier on the hands than Manila but is still a rough, thick braid. It won’t be as comfortable as the rope we’ve got next, Nylon. All the same, it’s very strong and lighter weight than most other ropes. Hauling it around won’t be a problem. It won’t stretch out with weight either, it’s a rope you can depend on. This rope gets its name from the inner core being braided and then being sheathed in another braid. The double braid is able to hold its shape under pressure which leaves it strong and resistant to abrasion. It’s long lasting, comfortable to climb on, and won’t shred like Manila. Use this rope when you’re climbing up something else, like rock or a wall. You need to consider two things when purchasing this type of rope. The weight of the rope. The weight this rope will hold must be your weight and the lighter the rope is, the easier it will be to transport for climbing adventures. Depending on the type of rope you purchase, the weather it’s exposed to, and how you work with the rope, you may want to invest in some gloves. Rope burn is a hazard when climbing and gloves would offer protection and extra grip. Leather gloves with or without fingers and an adjustable wrist will do the trick. The best way to prep for rope climbing is by working on upper body strength, core strength, and grip. Remember to start slow and adapt the techniques for your body. Farmer Carry is a great exercise to work on your grip. Grab any two things that are equal in weight like kettlebells, dumbbells, or filled buckets. With straight arms, hold them down by your sides and walk up and down wherever’s convenient like your driveway or the length of your gym. Work on ‘towel pulls’ where you throw a towel over a bar, grab each end and lift your feet off the floor. Pull one side of the towel at a time to raise and lower yourself. Hang from a bar, lift your knees to your chest. That’s a leg raise! A great way to work on your core before climbing. Try doing Close Grip Chins. On a bar, put your hands close together, palms facing away from you in a chin up position. Fully extend your arms at the bottom of the exercise, bend your elbows to lift yourself up and until you are at least in line with your hands. You can also do pull ups on the rope. Reach your hands up and grab the rope. Hang down for as long as you can, knees bent. Pull your chin up over your hands. Lower to the ground and repeat. Jumping pull ups are another option if you’re struggling to do a pull up. At head level, grab the rope with your hands. Bend your knees slightly and hang. Use your legs as you need to jump up and pull down on the rope to pull yourself up. You’re just trying to pull your chin up over your hands, don’t jump higher than that. Control your body by engaging your core and lowering yourself slowly. Repeat. Tried and true, work on doing squats. Doing squats will help you push your body weight up the rope. Up the intensity by trying single leg squats too! The single leg squat is a tough but very effective exercise. Balance on one foot and squat down. When you’re bending at the knee, sit your hips back as if you were sitting in a chair. You should be at a 90-degree angle when it’s time to come back to standing. Row and Switch is another worthwhile exercise. Grab the rope with two hands and walk your feet backwards so that you are at an incline. Your arms will anchor you for the forward movement you’ll be doing. Engage your core so your entire body is a straight line. Push your chest forward, switch your hands so that the one on the bottom is now the one at the top. Lean back and repeat. You’re not climbing up so much as in place. Bent Knee Horizontal Climb is a horizontal rope exercise best used to build up back, bicep and grip strength. Start standing and holding the rope with both hands at head or shoulder height. Engage your core, lean back, and lower yourself down, hand over hand. Bend your knees as you lower yourself. Get as close to the ground as possible before climbing back up. Always use hand over hand, don’t drag yourself up. Straight Leg Horizontal Climb Similar to the Bent Knee Horizontal Climb, except you want to keep your legs straight. You can also adjust this exercise by holding the rope at a higher or lower position and how close to parallel you can get to the ground. Place the rope between your feet, which should be about shoulder width apart. Grab the rope with one hand over the other and walk your feet back so you become more horizontal. Engage your core to keep your body in a straight line. Keep those arms straight out in front of you too. Get as close to the ground as you can. Pull yourself up the rope, hand over hand. When you’re back to standing position, reverse your hands and start again. Once you’re strong enough to climb, you’ll need proper techniques to get going. We’ll get into eight different rope climbing techniques next. The Gym Class Lock technique is how you probably learned to climb rope in school. It’s a reasonable way to climb and a great way to start, but it’s not the most effective. In fact, you’re working twice as hard as you need to and using a lot of upper body strength. Reach up and grab the rope. Jump up on the rope and pinch it between your feet. Your feet should also be pushing against each other, a bit like doing a butterfly stretch in the air. Use your feet to push off and reach higher. Hold the rope tightly with your hands and tuck your knees up to continue squeezing the rope between your feet. To adjust the Gym Class Lock, you can use a knotted rope. As the name suggests, at regularly spaced intervals there are knots in the rope. The knots will help you to balance and offers a moment to rest as you build up the muscle and stamina to climb. Get a firm grip on the rope. Place your feet on both sides of the lowest knot. Climb as you would using the gym class technique. This is a technique that secures your weight without using the strength of your arms and hands. The downside? It’s not the fastest way to climb and if you lose the wrap, it’s going to take more time and energy to reacquire it. Jump up onto the rope with your arms extended. Let the rope fall between your thighs or on the outside. Tuck your knees up and step down on the rope with one foot. With the other foot, press up on the loose end. The shoe of the unwrapped leg traps the rope between the two shoes. Squeeze the rope with both of your feet to hold it in place. Push up and straighten your legs as you reach up with your arms. The more you reach up before locking, the more you can push off your legs and use them to help you climb. If you want to use less upper body strength than required for the Wrap and Lock, this might be what you’re looking for. Be careful though, you’ll be consistently dragging your legs along the rope so long pants are a good idea to avoid rope burn. Wrap one of your legs around the front and then the back of the rope. The rope should lie flat beside your thigh then curve around the back of your thigh, calf, and then front of your shin and ankle. Reach your hands up over your head and grab the rope. Pull up and tuck your knees up with the rope wrapped around your leg. Stomp down on top of the rope with your free foot, pushing the rope down into your bottom foot. Straighten your legs and stand up, then grab higher on the rope. Keeping the rope wrapped around your leg, release the top foot, and tuck your knees up. Repeat the wrap and stomp movement with your other foot. Stand back up and reach higher on the rope. This rope climb allows you to use your hips as you climb. Wrap your leg in front and then in back of the rope, just like in the Stomp and Stand. Reach up overhead with your hands and pull up. Tuck the knee of your leg with the rope wrapped around it up. Let the rope slide down your leg, around your calf and straighten this leg. Press your other foot down on top of the rope, it should be near your ankle. Your legs should be straight out in front of you, like you’re sitting in the air. When the rope is secure between your feet, straighten your leg down towards the ground. You’ll be standing at this point. To repeat: Reach up with your hands, tuck your knee up with the rope around your leg. Straighten your leg in front of you, secure the rope with your other foot, then straighten your leg back down towards the ground creating a standing position. The point of this technique is to climb the rope with your legs stretched out in front of you for the entirety of the climb. This technique is called the ‘L’ because when looked at from the side, your body will look like an L.
Start on the ground with your hands gripping the rope and your legs straight out in front of you. Place your lower hand above your upper hand and repeat. Remember to keep your legs horizontal until you get to the top of the rope. This technique is for those with strong upper bodies. You’re consistently pulling up all of your body weight up without any help from your legs. Grab the rope as high as you can. Move one hand over the other until you are all the way up. Congratulate yourself! This is not an easy technique and few can manage it. The Walk is great for climbing up a wall or rock but like with the Upper Body Struggle you’ll need upper body strength to be able to hold your body weight while walking. Grab the rope tightly with both hands and keep it in front of you. Put your feet up on the wall/rock and slowly walk up the wall. When you can’t move your feet farther up, you’ll have to move your arms up higher. Keep pulling yourself up and keep walking. Reverse slowly and maintain control to come back down. You’ll be at an acute angle with the wall but if you take your time and go slowly, you’ll be able to strike a good balance with the weight on your upper body to be able to keep climbing. This technique requires two ropes, as the name suggests and lots of upper body strength. No feet are used for this one. Set two ropes shoulder length apart. Take one rope in each hand, stand between them. Pull yourself up on each rope, one hand at a time, letting your feet dangle before beginning to climb. Gripping the right rope, slide your left hand up the length of the rope. Grip it tightly when you’ve extended yourself. Fitness, fun and survival all come together when you learn how to climb rope. It’s a great way to spice up your fitness routine and get you into other diverse activities like obstacle courses and mud runs. And best of all, you can alter the intensity of your climbs easily. We’ve gone over the equipment you will need to climb safely and effectively to meet your goals. The easiest way to get started is with 20ft of Manila rope and a tree in a backyard or using the ropes at your gym. To prep for a climbing, there’s a wide variety of exercises you can do on rope, like the Row and Switch or off rope like a Farmer Carry. Once you feel strong enough to climb, start with the gym class lock and go from there. For more tips on how to choose the best climbing rope, see our must-read article to find out. Which technique is your favorite to climb by? Do you have another method that works better for you?